You can forgive some incoming Prince Edward County Councillors if they were humming ‘See you in September’ and had that back to school feeling after getting a crash course in municipal operations last week. A total of three orientation sessions at Highline Hall in Wellington that discussed everything from fire and rescue operations to water and wastewater systems to municipal processes and protocol were offered by the municipality’s senior department heads and CAO James Hepburn to councillors both new and returning to ensure the group are able to hit the ground running this week. Council were expected to gather for another three days of orientation exercises at Shire Hall sometime next week. Learning all the exact ins and outs of a $70 million operation over the span of six days isn’t possible however Prince Edward County Mayor Steve Ferguson explained that the process had to start somewhere. The new council, which was sworn in at a ceremony at Picton’s Regent Theatre on Tuesday evening, didn’t go into preliminary budget deliberations per se according to Ferguson but the group did receive briefing and cost breakdowns from various departments. Incoming councillor from Hillier ward Andreas Bolik likened the process to drinking from a fire hose but was impressed with the expertise and dedication from the staff who offered high level reports on each department. 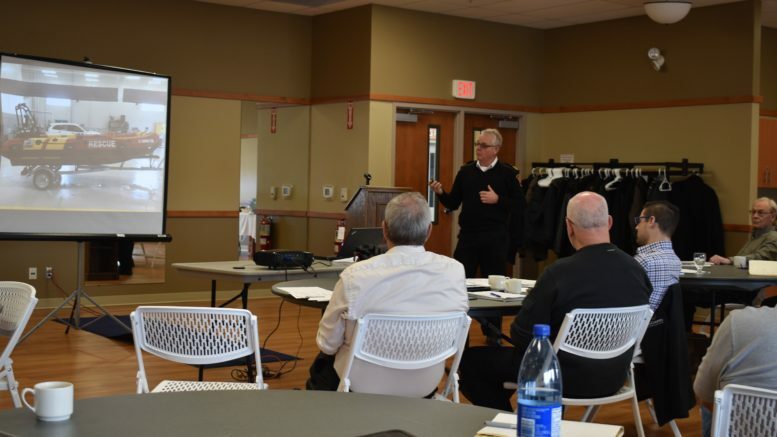 “It’s been very beneficial for all of us to see the breadth and depth of the level of services provided by the municipality,” Bolik said of the sessions. With a relatively healthy turnover of nine new councillors coming on board for the upcoming term, it would make sense if there was a collegial feel to the start of the term. Bolik said since so many are starting off on the same foot, the discussions and comments so far have been positive. Wellington’s Mike Harper was another incoming councillor getting his feet wet last week by examining the world of municipal government and operations. Harper concurred the group has already had great discussions and seems to be very dynamic in terms of a collective skill set. “It’s been great to meet with the other councillors and see that we have a really diverse group at the table. There’s a great combination of experience and new and different skills coming together and I think everyone has been really respectful of each other so far. I think we are going to be a good team,” Harper said. Harper admitted to developing a greater understanding and appreciation of the workings of municipal government, its responsibilities and the staff that make the operation fulfill the needs of the constituents.